1984-1989 Big Twin. 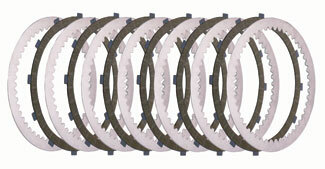 Includes six aramid fibers friction plates with tempered steel cores and seven tempered steel drive plates. 25% wider than OEM clutch plates for a significant increase in clutch area. Stack height is preset for easy installation (run wet or dry). 25% WIDER THAN STOCK for maximum holding.